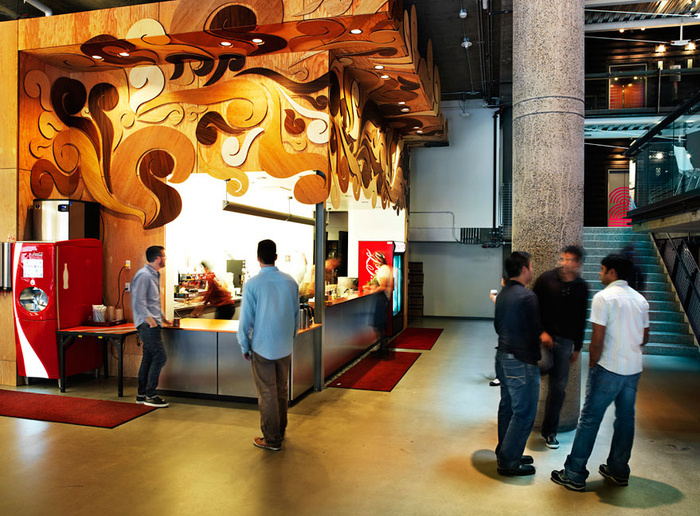 Zynga, the gaming company known for such hits as FarmVille, CityVille, and Words with Friends, is headquartered in a massive 556,000 square foot space on the edge of SoMA in San Francisco, California which was designed by NicholsBooth Architects. During my visit to the space several weeks ago, one of the most impressive features of the space was the free meal program. Yes, the free meals. Other companies provide this luxury, but most of them don’t provide free breakfast, lunch, and dinner to 2000 employees that want it. In terms of structure, the company is divided into teams based on the projects they are working on. So CityVille houses a portion of one floor, and FarmVille another. You get the idea. The building itself is six floors, with a huge atrium space spanning through the middle that really opens the whole place up. Throughout the office are games and decorations that keep the space fun and in-sync with the company ‘Play Well’ motto. Luckily, employees are closed off from this main space in their workspaces. That said, desks are arranged in an open layout, which for space’s sake, is basically a necessity. The amount needed to house 2000 people privately/semi-privately is fairly ridiculous. Here’s an example. The company offers employees an awesome wellness center on the bottom floor, where essentially everything but personal training sessions are free. Photography by the amazing Jason Madera. Special thanks to Jim Morgensen for the tour!